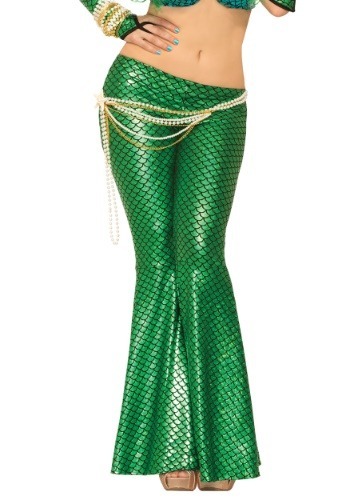 Leggings have elastic waist and attached wide leg "fins"
Mermaids are hot right now. We get it. There are so many things that mermaids are experts on that humans just can't compete with. For instance, no matter how many times you go out for California rolls, deep sea beauties are always going to have better taste in sushi. They will always know how to pose on the slippery rocks while singing into the misty ocean air. Also, while none of us can really get over the gorgeous blue and green ombre dye jobs that are taking over our Instagram accounts, there are no hair stylists that can do what salty ocean waters can do. While humans might be a little grossed out with having seaweed intertwined into their locks, mermaids know that comes with the territory of being a seafaring lady. Isn't that why we all love free-spirited mermaids? These flared iridescent mermaid pants make it easy to put together your dream mermaid ensemble. The fabric has a gorgeous sheen to it with a scale pattern. The hips are accented with a gold chain, pearls, and a starfish that would be all the rage in any mermaid cove. Pair these pants with a seashell cup bra, some gorgeous hair accessories, and our mermaid sleeves. Whether you're dressing up for Halloween or a fabulous nautically themed party, you're sure to feel like your on the tide of mermaid fashion when wearing these lovely fitted yet gracefully flared mermaid leggings. From your shiny green fishtail to your lovely, briny do, you're sure to look like you're the queen of the cove. So, ready your siren song, the world is your oyster!